An adequate history of Indian Medicine has yet to he written, though the importance of the subject has been acknowledged by eminent. authorities, Professor Max Neuhurger of the University of Vienna records the opinion that "the medicine of the Indians, if it does not equal the best achievements of their race, at least nearly approaches them, and owing to its wealth of knowledge, depth of speculation and systematic construction, takes an outstanding position in the history of oriental medicine. Thanks to the inexhaustible fount of Sanskrit Literature, its development Can be traced in outline at any rate from its primeval origins in empiricisms and theurgy to its height as a completed system of learning." (Neuburger: History of Medicine, translated by Playfair, Vol. I, p. 43.) It needs no elaborate argu- ment to establish that this "inexhaustible fount " requires for its complete exploration an army of scholars; and till this has been achieved, summaries of the history of Indian Medicine must continue to be incomplete and fragmen- tary. We cannot consequently express surprise when we find that Neuburger in his great work devotes only 18 pages to the subject, while Professor Buck of Columbia in his work on "the Growth of Medicine from the earliest times to the end of the 18th century" contents himself with a few paragraphs which occupy 8 pages only. In these circumstances, it is no wonder that the topic is not even mentioned in the brilliant lectures on "the Evolution of Modern Medicine" delivered by Sir William Osler at the Yale University in 1913. I have stated enough to establish the importance of the work undertaken by Dr. Girindrsnath Mookerjee. In 1909 the Univer- sity awarded him the Griffith Memorial Prize for the encouragement of advanced study in Science and Letters, on his valuable thesis dealing with the Surgical Instruments of the Hindus. This work has already been published in two volumes and its merits have been widely recognised. 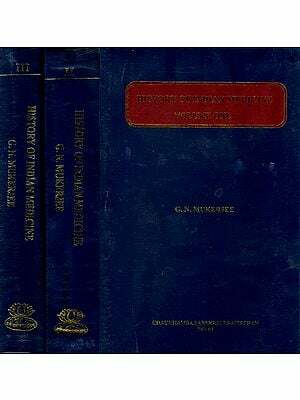 In 1911 the University again awarded the Griffith Prize to Dr. Mookerjee for his exhaustive thesis entitled" Notices, Biogra- phical and bibliographical of the Indian Physi- cians and their works on Medicine." This was followed in 1913 by a thesis on "the Science of Medicine in the Atharva Veda," which parti- cipated in the award for that year. 'The materials thus collected are of immense value and will occupy several volumes. The financial difficulties of the University have led to an unfortunate delay in the publication of the work and it is a matter for congratulation that the first volume will now be in the hands of scholars. The subsequent volumes are in the press and will be issued as rapidly as Circumstances permit. The first volume of the History of Indian Mediciue is now offered to the public. It is now many years since I undertook and completed the book, I submitted it as a thesis for the Griffith Prize for original research: "Notices Biographical and Bibliographical of the Ayurvcdic Physi- cians and their Works on Medicine," It was commended and the prize was awarded in 191 I. I regret that so long a time has elapsed in the publication of the book, During the last few years there have been advances in the study of history of medicine, Consequently in this edition, not only has the revision been exhaustive, but many portions have been entirely recast and largely re-written. While this volume represents data and conclusions drawn from individual research, it is at the same time largely indebted to the works of others, References have been given to all the authorities and original sources as far as possible. I may at once disclaim all pretensions to scientific treatment of my subject, I crave the indulgence of the readers for many shortcomings of the work, The writer is not master of his time, and the incessant engage- ments of his practice leave little leisure for literary works, '1'0 render the finding of any particular subject easy to the reader, I have enlarged the table of contents. The general index, which will be given at the end of the work, will facilitate references. Before concluding this preface, I tender my thanks to the Vice-Chancellor of the Calcutta Universiy, Sir Asutosh Mookerjee, for assistance of the utmost value in the preparation and publication of this volume. In fact, it might have been deferred much longer if 1 had not secured his valuable assistauce. I have also to express my gratitude to him for his kindness in writing a foreward to this volume. Weber, in his History of Indian Literature, remarks: “The number of medical works and authors (in Sanskrit literature) is extraordinarily large. The former are either systems embracing the whole domain of science, or highly special investigations of single topics, or lastly, vast compilations prepared in modern times under the patronage of kings and princes. The sum of knowledge embodied in their contents appears really to be most respectable. Many of the statements on dietetics and on the origin and diagnosis of diseases bespeak a very keen observation. In Surgery, too, the Indians seem to have attained a special proficiency and in this department European surgeons might perhaps even at the present day still learn something from them, as indeed they have already borrowed from them the operation of rhinoplasty. The information, again, regarding the medicinal properties of minerals (especially precious stones and metals), of plants, and animal substances, and the chemical analysis and decomposition of these, covers certainly much that is valuable. Indeed, the branch of Materia Medica generally appears to be handled with great predilection, and this makes up to us in some measure at least for the absence of inves- tigations in the field of natural science. On the diseases etc. of horses and elephants also there exist very special monographs." Dutt says: "The number of Sanskrit medical works, and especially of small compilations on the treatment of diseases, IS too numerous and indetinite to admit of detailed enumeration here. The enquirer after them is sure to find, in different parts of the country or seals of learning, many little manuals, essays and digests of which he did not hear before. It would seem that in the absence of printing, teachers of medicine used to prepare small compilations containing such prescriptions as they were in the habit of using', for the guidance of their pupils, who copied them for personal use." 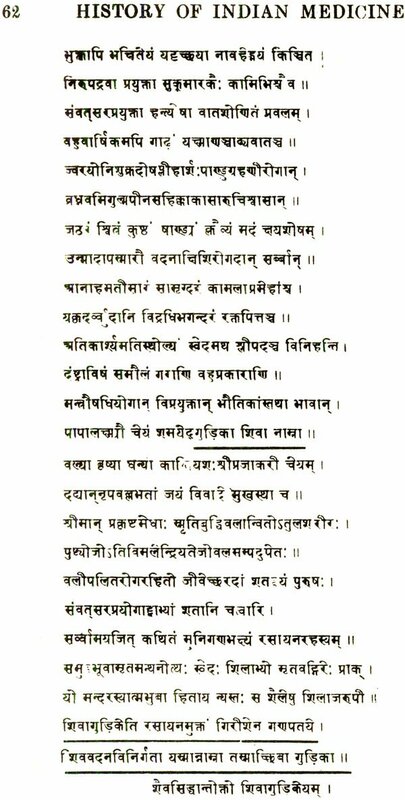 When writing on medical authors and their works in my thesis "The Surgical Instruments of the Hindus," 1 we noted that, besides the principal authors and original works mentioned therein, " the number of Sanskrit medical works is simply legion; many of them are daubed with fancy names and are excellent treatises on the different branches of medical science. I intend to publish in a separate volume short notices of the medical authors and their works and so we need not dwell on them here." The desire which I have long entertained of contributing to tha History of Indian Medicine bas now been realised, and the present attempt is to fulfil the promise made a few years before. In performing this duty I have endeavoured to embody my researches in a connected form, but I have not been inattentive to the works of other enquirers. It would be, no doubt, interesting to take a brief survey of the work done by scholars as regards our knowledge of Ayurvedic authors and their works. Prof. Wilson wrote on the early medical authors. Royle proved the originality of the Hindu medicine. His arguments for antiquity of Hindu Medicine are deservedly styled as epoch-making researches. Dietz has given in his Analeeta Medica a long abstract from Ibn Osaibe's biographical work, on the Lives of Indian Physicians. In Ainslie's Materia Medica, some of the medical treatises are mentioned. In Wise's Commentary we find a. list of the Hindu writers on medicine and their works. In Weber's History of Indian Literature, we have a few pages on the medical texts of the Hindus. Cordier's Recentes Decouvertes, Vagbhata. and other contributions supply many informations on the subject. Dutt in the preface to his Materia, Medica of the Hindus described some of the important works, and. similarly we find them described by the Thacore Saheb," in his History of Aryan Medical Science, with an important bibliography at the end. Roth's monograph on Caraka and the notices of medical authors in St. Petersburg Dictionary supply us with important details. A more systematic description of the authors and their works, we find in Jolly's Medicine in the Encyclopaedia. of Indo-Aryan Research (Grdr.). Hoernle's contributions '! The Commentators of the Susruta Samhita," and “ The Ancient Medical Authors" in his Osteology, and his magnificent edition of the Bower MS., are invaluable aids to our study. The notices of the authors in Ray's History of Hindu Chemistry,' and the preface in Kunte's Vagbhata are repositories of useful informations on the ancient medical literature. In the V anausadhi Darpana, Kaviraja Virajacarana Gupta, gives us an elaborate list of Ayurvedic books in Bengali, the important works- being described in detail. I have also availed myself of his contributions in his Account of the Principal works of the Atreya School of Medicine. Many MSS. are noticed in the catalogues of Sanskrit works; and I have derived special help from L. 1. O. cat., Nepal Cat., Bik. MSS., Oxf. Cat., Cat. Cat., G. O. M. L. Cat., etc., as these contain des- criptions of various MSS. ; and I take this opportunity of acknowledging my indebtedness to Mitra, Sastri, Bbandarkar, Aufrecht and others. It is more than probable that I may have failed to refer to some contributions which ought to have been mentioned, but I am confident that my sins of omission have not been numerous. It has been my earnest desire to omit nothing of importance. A sufficient acknowledgment of the source of the literature that has been laid under contribution will be found in the index of the authors quoted. A considerable lapse of time has occurred since the publication of the first volume and The second volume of History or Indian Medicine is now submitted to the public. In arranging the scheme and determining the scope of this work, certain points demanded censidera- tion and it has by no means been easy to arrive at a decision regarding them. A History of Medicine would not be complete if the account of the Sages who promulgated the science did not find a place here. Medical science in ancient times was a subject of study which all learned men, sages, and kings learnt for the benefit of the human race. In this volume the consideration of the pre-historic period-the aeeount of the gods and sages who took part in the development of the healing art in India, has been dealt with. To know the History of Medicine in Ancient India is to know the entire domain of Indology as the teachers of medicine were sages who were seers of the Vedic hymns, elaborated the philosophical systems, speculated on the existence of God, and were, in fact, concerned in the intellectual history of Ancient India. To deal with such a vast field of study is impossible for any man and many shortcomings would be found in the book. It is restricted to the collection of data which are not even logically and elassieally arranged. Genealog•jcal tables have been inserted wherever they were needed to elucidate the text. The article on Salihotra appeared in part in the Hiltorical Quarterly, Vol. I and Vol. II. The introduction appeared in the Journal of Ayurveda, Vol. II and Vol. III. The life of Atri has been described twice through oversight. My thanks are due to authors for quotations from their books and much of the best in this treatise is due to others. I am under a pleasing obligation to my son Jitendranath Mukerjee for valuable assistance in the correction of proofs. It is no doubt interesting to find that the public Las at last been awakened by a sense of responsibility as to their duty to help in the regeneration and development of Indian. medical science. 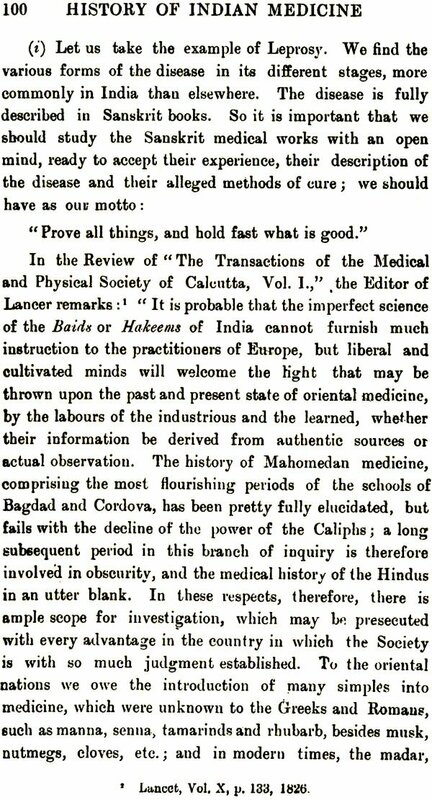 The Hindu physicians them- selves have felt the necessity of an organisation among their professional brethren for the consideration of the ways and means for the proper study and improvement of the science of medicine and for propaganda work to train public opinion and enlist public sympathy in its favour. The All-India Ayurvedic Conference was thus ushered into existence. It has been doing useful work in this direction and holds its sittings in different provinces year after year. Important discussions relating to some depart- ment of medical science are held there amongst the physicians of various parts of India and Ceylon, irrespective of caste or creed. Such deliberations have not only enriched science but cemented the friendship of delegates who represented the different sections of the population of India. The Head Office of All-India Standing Committee-The Ayurveda Mahamandale, and Vidyapitha-is located at Cawnpur for the present. About two dozen centres have been opened in the various parts of India to conduct examination of students in Ayurveda. Such centres of examination exist in Bengal, Behar, Oudh, Central India, Delhi, United Provinces, Rajput.ana, Central Provinces, Punjab, Sindh, Orissa, Dravida, Andbra Desa, Bombay, Karnatic, Berar, and Ceylon. Our Government could not sleep over this consciousness of the people to regenerate their own system of medical prsetiee. Colleges for systematic study and research have been established by the philanthropie and public-spirited citizens which have not failed to attract a due share of sympathy and patronage, however insufficient m compa rison to the universal good, the object of such institutions,-from the Government. The municipal and other corporate bodies have realised their duty towards the development of the indigenous system of cure which alone can reach the teeming millions of poor inhabitants through a network of charitable dispensaries and hospitals which will distribute remedial agents at a comparatively cheaper cost. Madras has got its Government Scbool of Indian Medicine, besides the Channa Purai Ayurveda. Kalasala, established by its public-spirited citizens. Ayurvedic Department has been opened in the Hindu University of Benares with a hospital attached. In this sacred city of the Hindus, and the ancient seat of Hindu learning and culture, the Ayurveda Vidysprobodhini Pathsala has been founded. In Rishikul, Hardwar, the Ayurveda Vidyapitha ; in Rishikesh, the Bawa Kali Kamblewaleka Ayurveda Vidyalaya ; in Pilibhit, the Lalit Hari Ayurveda College; in the Presidency of Bombay, the Prabhuram College;- all bear testimony to the self-sacrifice and energy of the founders and promoters of these centres of education. The Ayurvedic College of Gurukul, Kangri : the D. A. V. College of Lahore; and the Ayurvedic and Uuani 'I'ibbi College of Delhi, are now recognised institutions fOI' the cultivation and advancement in the science of Ayurveda. The Indian chiefs were not slow to manifest their sympathy towards this renaissance of Ayurvedie treatment. Jaipur had been the seat of a college of Ayurveda-the Jaipur Raj Ayurvedic Vidyalaya-financed and main- tamed by the State from a long time. The Maharaja of Alwar is well-known for his enconragement towards Ayurvedic studies. The Gawalicr Raj Ayurveda Vidya- laya, the Mysore Government Ayurveda College, the Patiala Raj Ayurveda Vidyalaya, the Trivandrum Govern- ment Ayurveda College, and the Baroda Raj Sanskrit Pariksa Samiti and the Ayurveda Mahavidyalaya, Patan, Baroda State, are unmistakable proofs of the faith of the noble Princes who are at the helm of these principalities. The Thakore Saheb of Gondal is well-known for his interest in the Ayurvedic science. Bharatpore spends a good sum for the treatment of its subjects according to the Ayurvedic metbod, and other States are helping in this regeneration of Ayurveda. Besides the Madras Government College of Ayurveda, there are other colleges founded by our Government: The Behar Government Ayurveda Vidyalaya at Jagga- nathpore ; the Muzzaffarpore Government Ayurveda Vidyalaya; and the Ayurvedic and Unani College at Delhi. The U. P. Government has the intention to appoint. a com- mittee to enquire about the indigenous system of medicine. The Government of the United Provinces has sanctioned the annual recurring grants-in-aid of Rs. 30,000 for the benefit of the Ayurvedic institutions under its jurisdiction and for the sanction of a donation of Rs. 50,000 and an annual recurring grant of Rs. 5,000 10 aid of the Rishikul Ayurvedic College. In Bengal an Ayurvedic Committee was appointed by the Government of Bengal in August 1921: In 1925 the Committee submitted a Report for the consideration of the Government. The decision of the Government of Bengal is being anxiously expected by the people but we do not know when it will be made public. Three Ayurvedic Colleges have been started in Bengal; the Astanga Ayurveda Vidyalaya, the Vaidya Sastra Pitha, and the Ayurveda Vidyalaya named after Govinda Sundari the mother of Maharaja of Cossimbazar. Of these the Astanga Vidyslaye is better equipped with library, laboratories, etc., and is likely to have its buildings completed soon. The Corporation of Calcutta appointed a Committee to find out means for the amalgamation of the three colleges, but notwithstanding the best efforts of the committee the amalgamated College of Ayurveda could not be established. I was a member of the committee, and the report we submitted is annexed herewith for the information of the public. The Corporation has sanctioned grants-in-aid for the three schools. The Corporation has opened Ayurvedic charitable dispensaries in the different quarters of the town. Four charitable dispensaries have already been started in its four districts,-an example which has stimulated other provinces and even villages. The Municipalities, District Boards, Union Boards and benevolent citizens have thus recognised the claims of Ayurveda as a system of medicine which requires improvement and help. 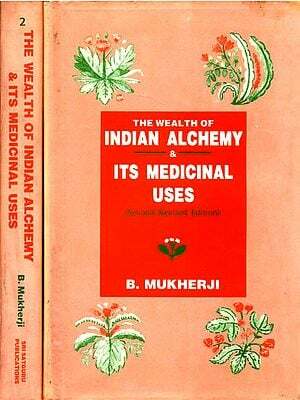 The third volume of the History of Indian Medicine IS now offered to the public. It is a tardily-issued publi- cation and brings us down to the end of the historical period designated by "B. C. or (Before Christ)." The material here presented had been collected several years ago, but circumstances have delayed the publication long beyond the time originally thought of. Manuscripts of a publication of this character cannot be sent to Press in absolute completeness, since new information is being published in India, in Europe and in America. I am anxious to make it as complete as possible, and I alone am responsible for any sin of omission or eommisaion. A preface is often an excuse, and the apology offered in the Preface to the Second Volume of this book for the oeeurrenee of delay in the publication is also necessary here. Some of the pages of this volume have already appeared in print. But even though a book goes over old ground, it may yet be welcome, as the subject dealt with in it requires elucidation and confirmation, especially as this volume contains between two covers a mass of material which is highly useful in the history of the ancient system of medicine. Nowhere will The student find a connected history of Jivaka, Therefore extensive quotations have been made to complete his life history from the works of Savants whose names have been duly acknowledged in the text. No one can write upon the subject of this book without lying under obligation for the information contained ill this volume to the authors who have already written on some portion of the subject, and I take this opportunity to thank them. I have copied some authors copiously as my desire was to render their masterly contributions accessible to the readers. The arrangement of material has neces- sitated that the description given in one place has had to be repeated at different places for the convenience of the reader. Foot-notes have been avoided as they encumber the pages and interrupt the reader's train of reading. all references have however been given in the text at their proper places. We have long wanted a text-book of the History of Indian Medicine that covers the whole field and presents the subject in a manner suitable to the needs of the student. The task is arduous and self-imposed. I look back upon the three volumes that have been published by the University as the realisation of my wish in part. Other volumes have long been due but I do not know when these will be completed. The difficulties surmounted by savants to raise com- parative philology and comparative mythology to the dignity of science were very great indeed. It required the life-long labour of many renowned philologists and mytho- logists of many nations. With the bi-lingual inscriptions, -Egyptian and Greek,-on the Rosetta stone discovered in 1799, the interpretation of the Egyptian hieroglyphics became possible by Champollion, and gradually the entire maze of alphabetic and syllabic signs, determinatives and ideograms, was deciphered by Rawlinson, Hinks and Oppert ; and this decipherment was rightly regarded to be one of the greatest achievements of the nineteenth century. In deciphering cuneiform writings, the Ancient Persian and Babylo-Assyrian systems had to be learned, say, the Ancient Persian itself had to be deciphered. What was worse, there was no derivative language to serve as an auxiliary, like the Coptic, a daughter- language of the Old Egyptian, as in the case of the hieroglyphics. The tri-lingual cuneiform inscriptions of Darius and Xerxes were discovered to be in the Ancient Persian, Susian and Babylo-Assyrian. Grotefend thus became able to discover the Indo-Germanie idiom of the Ancient Persian Achaemenid kings. Burnouf, Lassen and Rawlinson then completely deciphered the Ancient Persian which served as a key to Baby lo-Assyrian cuneiform writings of by-gone ages. To Sir William Jones we owe the identification of Sandrokoptos of the Greeks with Candra Gupta, the Maurya monarch, whose date, and the date of the conquest of Alexander the Great, served as land-marks in the study of Ancient History of the Hindus. With the help of Vedic references illucidated by the comparative science of language, Buddhistic records, Singalese versions, epigra- phical and numismatic discoveries in the finds of Coins and inscriptions on stone and copper-plates, native chronicles and notices of Chinese, Greek and other foreign writers, contemporary literature, and accounts of contemporary events, and Chinese and Tibetan records, it became possible to build up the history of Indian civilization. The inscriptions of Asoka on pillars and rocks had remained uuintelligible until James Prinsep deciphered these inscriptions; discovered the Pali language, and thus illuminated the Buddhist history and antiquities. Burnouf traced the inter-relation of the Zend and the Vedic Sanskrit, and with the help of his Comparative Grammar, deciphered and explained the Zend language and scripture. The German scholars, Hopp, Grimm, and Humboldt, detected the connection among the Indo- European languages,- Sanskrit, Zend, Latin, Slav, Teuton and Celtic,-the offshoots of the same original stock, and thus laid the foundation of the Science of Language, on which an embellished edifice had been built up by many scholars; a notable name to mention is that of Max Muller who not only returned us our Vedas, but with the collaboration of distinguished scholars supplied us also with faithful translations of Sanskrit, Chinese, Zend, Pahlavi, Pali and Arabic texts. In a similar way, the unity of all religious beliefs had been traced by the study of Comparative Mythology and Religion. Introduction: Comparative Medicine -It can reveal the state of medical knowledge. Comparative philology and Comparative mythology -Rosetta stone. The tri-lingual cuneiform inscriptions of darious and Xerxes. Sandrokoptos. Labour of Champollion, Rawlinson, Grotefend, Burnouf, Jones, Bopp. In medicine -Egyptian Papyri; Pali and Sanskrit Buddhist literature; Greek and Roman medicine; Veda and Zend; Tibetan Tangyur and Kangyur, Arabic and Persian, Tamil and Singaless Medicine; and Medicine in Java, Burma, China and Ceylon. The necessity to learn classical and modern European languages. Folk medicine. The different systems of medicine, and their classification. Empirical knowledge. Indian system is not a "solitary system" but has much in common with the other systems, -Persian,Mesopotamian. The use of such a study. Revival of Hindu medicine -Journal of Ayurveda. Text-books. Vrddha Susurta or Susruta 1-Susruta Tantra and Susruta Samhita. Dhanvantari and Susruta. Age of Susruta, -its uncertainty. Two periods of Hindu medicine. Absurdity of Haas' theory, Redaction - Nagarjuna, Candrata. Laghu Susruta and Susrutasara. Commentaries. Editions, Translation, Quotations from Sausruta Tantra. Its eight sections. 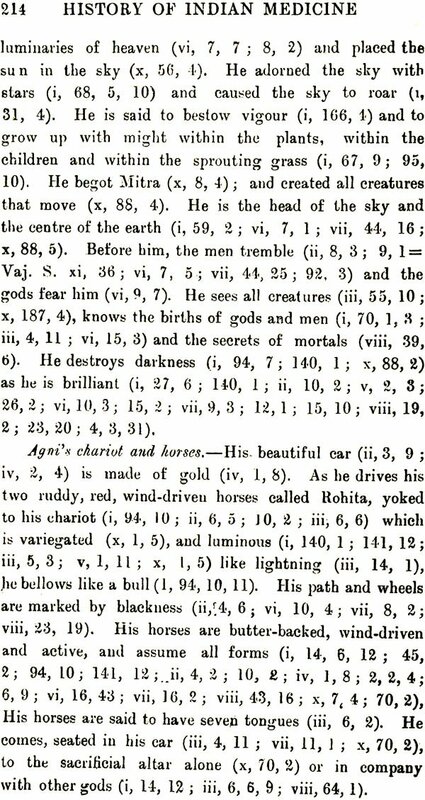 Index of Susruta Samhita -its six sections. Analysis of its contents. MSS.